Security forces have arrested the most wanted terrorist in the kingdom, the official Saudi Press Agency said Friday. Faris Ahmed Jamaan al-Showeel al-Zahrani was arrested on Thursday night with another person whose identity should not be disclosed at this stage, an unidentified Interior Ministry official told the agency. The arrest had been reported without sources on the pan-Arab TV channel Al-Arabiya late Thursday. The Saudi-owned station said police detained al-Zahrani in Abha, a town 500 miles southwest of the capital, Riyadh. A cleric, al-Zahrani was No. 12 on the kingdom's list of the 26 most wanted terror suspects. He rose to prominence as the security forces detained, or killed in gunbattles, more than half of the suspects on the list. Another indication of his significance was given by Islamic Web sites where sympathizers posted messages Friday regretting his arrest and asking God to give al-Zahrani strength. The Interior Ministry official described al-Zahrani as "one of the heads of strife, a preacher of denouncing people as infidels." Islamic militants often label their enemies as infidels before they attack them. The official did not describe the arrest, but said al-Zahrani and his accomplice were detained "swiftly and efficiently," and were not able to use the weapons they were carrying. Four weeks ago, al-Zahrani boasted that he was evading the police dragnet. "I would like to reassure the people who love me," he wrote in the Internet periodical Voice of Jihad (holy war), "I am careful in my movements and contacts, and I take all necessary precautions." In the same statement, al-Zahrani rejected the limited amnesty that King Fahd offered militants in June. The amnesty said that those suspected terrorists who surrendered within four weeks would be spared the death penalty. 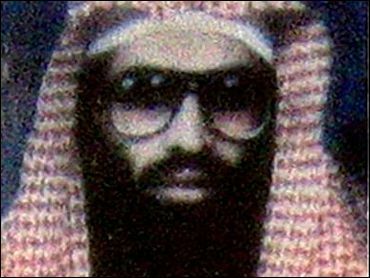 The liberal, Arabic-language Web site www.elaph.com describes al-Zahrani as "one of the most prominent theorists for terrorist cells in Saudi Arabia." It says he is 30 and has a master's degree in Islamic Law from Al-Imam Mohammed bin Saud Islamic University in central Saudi Arabia. The Web site said Friday that with al-Zahrani's arrest, only 11 of the 26 most wanted terror suspects are still at large. In Friday's Saudi Press Agency report, monitored in Cairo, the Saudi official said: "The Interior Ministry wishes to emphasize to all people that the security forces are determined to pursue the terrorists, get them out of their holes, and apply God's law to them." The Saudi authorities launched a nationwide hunt for terror suspects, detaining hundreds of people, after a coordinated series of suicide bombings in May 2003. The kingdom suffered major attacks in November and April-May this year, including the kidnapping and killing of Westerners. Saudi and U.S. officials have blamed the attacks on the al Qaeda terror group, which is led by the Saudi-born Osama bin Laden, and militants of similar anti-Western ideology. A militant Web site known for carrying militants' statements bore several messages early Friday about al-Zahrani's detention. "God strengthen Faris al-Zahrani's heart. Make him calm and support him," said a site contributor who used the pen name "Ishraqet Amal" or Dawn of Hope. "As he championed righteousness and waged holy war for your sake, God, support him and don't let the infidels get to him (psychologically)." A contributor who used the name Abu Asli said of the arrest: "I pray to God that this news is false."